Patience. Photography is about patience. Just wait...wait...wait for the right shot. There is just a split second that a butterfly’s wings are completely open, or that a bumble bee on a flower is completely in focus and sharp. And there is just a moment that a quilt is hanging on a line and is artfully blowing in the wind that doesn’t have a dog in the frame! These are just a few outtakes from my quilt series that I thought you might enjoy! 4. Okay, there’s a dog on one side and the quilts are flat, wait for it…. 5. Nice! The quilts fell back and no one will know there is a dog on the other side! 7. I thought it would be cute with Lucy just peeking around the quilt, then comes Gracie with that rubber chicken! 8. In comes Lucy to hog the photo op from Digby. What a day! LOL! this is great! nice shots and story behind it! 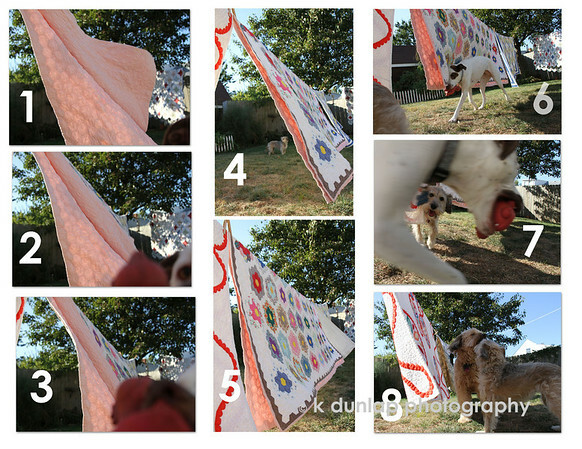 Nice series of shots for this collage, I especially like #6 he looks like he is in stealth mode trying to go unseen. Wonderful commentary! I got such a good chuckle about this light hearted but all so true commentary about the trials of taking 'simple' shot. Wonderful presentation. Great humor. Super series!